PLANO, TX--(Marketwire - April 24, 2008) - Ralph Oats and Cathy Oats, Founders of Wellness International Network, Ltd. (WIN), a company known for its high-purity omega-3 supplement, WINOmeg3complex™, are pleased to announce the "Summer Shape Up" weight loss competition for local consumers in the Dallas / Ft. Worth area. Participants have a desired weight loss of at least 25 lbs. and have committed to take WIN's nutritional products for a four-month period, all while living a healthier lifestyle. To help these individuals attain their goals, WIN has provided free products to participants and is helping track their progress. Additionally, at the completion of the contest period, WIN will also reward a makeover, photo shoot and $500 shopping spree to the winner. WIN's "Summer Shape Up" is an exciting way for WIN's Marketing team to capture the journey of consumer weight loss and give people the motivation they need to reach their weight loss goals. "Thanks again for this opportunity -- I've been taking everything, exercising and watching what I'm eating. I feel more energy already and it seems like my appetite has decreased which is wonderful!!" says one committed participant. At the first weigh-in, many of the participants stated they feel better overall, physically and mentally. WIN has plans to promote the results of the "Summer Shape Up" competition in company marketing materials, including WIN Today, winltd.com, brochures and more. For over 15 years, WIN's products have given the advantage to many battling their weight with the BioLean® weight loss system, which includes BioLean II®, BioLean Free®, BioLean Accelerator™, BioLean LipoTrim™, BioLean Mass Appeal™, and BioLean ProXtreme™. Wellness International Network specializes in health and nutritional products. WIN's complete nutritional line is listed in the Physicians' Desk Reference® (PDR®) for Nonprescription Drugs, Dietary Supplements and Herbs, the authoritative reference for health care professionals. Serious athletes are delighted to learn that WIN Worldwide BV participates in the Netherlands Security System Food Supplements Top Sport [NZVT] system with the following products: ProXtreme™, Mass Appeal™, Sure2Endure™ and Phyto-Vite®. This system controls only on a batch basis; for additional information click here. Learn more about why "It Pays to Live Well®" at winltd.com. 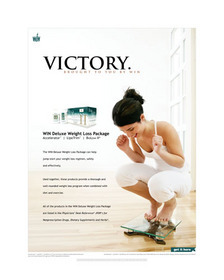 The WIN Deluxe Weight Loss Package can help jump-start your weight loss regimen, safely and effectively.